Describe how a user can attach files to emails. Describe the capabilities of solution management and Salesforce Knowledge. Describe the capabilities of the Communities application. Describe the capabilities of case management using the case feed. Now let’s see what’s new in Summer ’18 for your service agents and look at a new feature for communities. 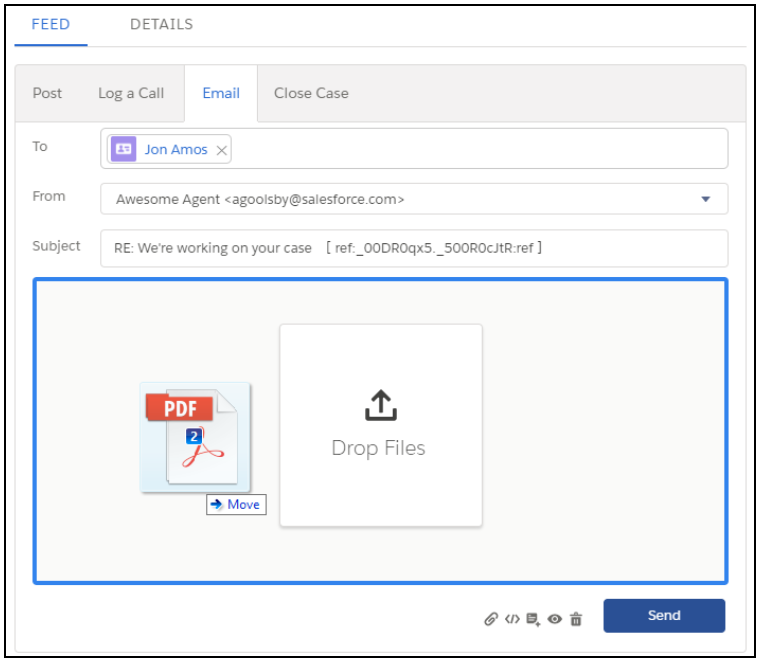 You can respond to customer emails faster. Previously, to view the Reply, Reply All, and Forward actions, you had to expand an email in the case feed. Now you can view the actions without expanding. The dropdown menu for emails in the case feed now includes the Reply, Reply All, and Forward actions. You need the “Send Email” permission to view the new dropdown actions, but if you’re an agent who currently respond to emails, you probably already have this permission. You can drag and drop email attachments. For new orgs, the case record page provides this email action by default. Double-check to make sure you’ve got the HTML action in your layout instead of the plain text action. You can drag multiple files as long as they don’t go over a total of 3 MB. You can now switch languages on the fly with the Language Switcher component. With the Language Switcher Lightning component, you can quickly see available translations, and, in orgs with multi-language enabled, you can see both draft and published language. Users with Manage Articles, Create, Read, Edit, or Delete permissions can access the Language Switcher. This new feature makes switching between drafts and published translations easier, which is a real win for translation managers, authors, and editors. The language Switcher opens a scrollable dropdown that displays all available draft and published article versions in all available languages. If your org already has multiple Knowledge languages enabled, the Language Switcher is enabled by default. You can now let community members author knowledge articles. Your community members are knowledgeable folks, so give them the power to help others by writing or revising knowledge articles. You can now give read, create, edit, and delete permissions to community members with any community license type. However, only members of communities built using Salesforce Tabs + Visualforce can author articles. To enable this feature, change permissions in Salesforce setup using either Lightning Experience or Salesforce Classic. To let community users write knowledge articles, select Knowledge User on their user detail page. Give the correct permissions on the article type either using a custom profile or by creating a permission set.